The good: It?? ?s a good location in Old Havana where a friendly family will welcome you and help you with your trip. The casa particular is also comfortable and can accommodate up to 5 guests in its two rooms. Breakfast is delicious. The bad: Maura doesn?? ?t speak good English. The area could be a little noisy in the afternoons. There are stairs that would make handicapped people difficult to get to their rooms. Maura often refers clients to other nearby casas particulares. 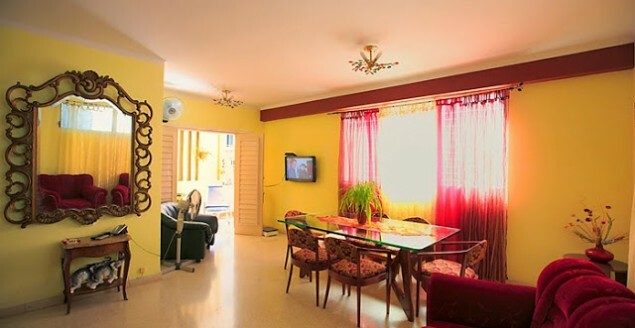 The bottom line: Casa Particular Maura offers a true bed and breakfast experience in Cuba if you?? ?re lucky to book early. Casa Maura is the #1 Casa Particular (Bed and Breakfast) listed in Trip Advisor. Let?? ?s explore its features. The quite modern-looking apartment is very comfortable and clean. It has two floors up narrow stairs and has two padlocked gates to open in the evening. Don?? ?t be concerned about the street, its fine, just a typically scruffy Havana St. This house has stairs??? so if for any reason the travelers have issues with steps, they should consider a different option. There is an elevator in the building which would make it easier to carry your luggage. Both rooms are quiet, have A/C and their own bathroom. Casa Maura has one twin room (two single beds) and a double (double bed). Make sure you let Maura know whether you want a queen bed or two single beds if you are traveling with another person. The rooms are fairly spacious, bright, well ventilated, stayed cool and have good bathrooms ??? although sometimes there was no hot water. It?? ?s advisable to book early as Maura usually refers to other casas particulares in the neighborhood like Anairis, ? ?Graciella and Vladimir, Teresita, etc. It is only a couple of minutes??? walk from the Museum of the Revolution in Old Havana and the Malecon, half a block from Prado. The location is fantastic for exploring La Habana Vieja on foot where many of the interesting attractions are. It was often noisy during the afternoon but was quiet at night. You will feel very welcomed, like being in your own home. Talking to Maura (if you speak Spanish) will be a good experience. Maura is extremely helpful but doesn?? ?t speak much English (as of Feb 2012). ? ?Her children speak perfect English. giving suggestions and helpful tips about Havana. calling to other Casas around Cuba that you might have booked. Offering friendly helpful advice with smiles and hugs. Breakfast is an extra cost on top of the per nightly room cost. It consists mainly of: eggs, fruit, bread, jam, coffee, juice. We would recommend you to stay at Maura if you?? ?re just exploring Old Havana but it might be better just to stay in Vedado area and have some day trips to the Old part of the city.